Kayla Gaytan, who gave birth to quadruplets and is fighting cancer. A Tennessee military family received a huge outpouring of support recently after the mother was diagnosed with cancer while carrying quadruplets. Sgt. 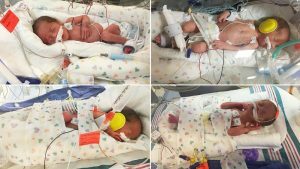 Charles Gaytan and his wife, Kayla, welcomed the naturally conceived quadruplets into the world on Dec. 30, but their birth was bittersweet. Doctors delivered the babies early by cesarean section because their mother needed immediate cancer treatment. The Daily Mail reports the Fort Campbell, Tennessee family is doing relatively well. Kayla currently is undergoing cancer treatments, and the four babies are in the neo-natal intensive care unit. Doctors said the four siblings should be well enough to go home in a few weeks. Their story attracted national media attention, and a donation fund for the family has received more than $1 million to support them, according to the report. Before the quadruplets were conceived, Kayla was diagnosed with Hodgkin’s Lymphoma, according to the report. The young mother said she went through five months of chemotherapy and was in remission. Not long after that, the couple was overjoyed to learn that they were pregnant – something doctors told Kayla might never happen. Not only that, but they had conceived quadruplets naturally. Later into her pregnancy, Kayla said she began noticing symptoms of cancer again. Doctors confirmed it, her Hodgkin’s lymphoma had returned. Though relatively treatable, the cancer can be serious if it returns, according to the report. Doctors gave the Tennessee mother a 50-percent chance of living five years, she said. When she was 30 weeks pregnant, Kayla gave birth to her babies in an emergency C-section. The babies, Lillian, Victoria, Michael and Charles were born weighing between 2 pounds, 8 ounces and 3 pounds, 2 ounces, according to the report. Doctors immediately began Kayla’s cancer treatment. She said she will have a stem cell treatment and a 16-month round of chemotherapy. The Gaytan family said they are not giving up hope. With the quadruplets and two older children to care for, Kayla said she and her husband are trusting in God to handle the situation. “We know that He’s gotta have a different plan up there for us, and surely everything’s gonna work out in the end,” Kayla said. This entry was posted on Wednesday, February 1st, 2017 at 7:16 pm	and is filed under News & Commentary. You can follow any responses to this entry through the RSS 2.0 feed. You can skip to the end and leave a response. Pinging is currently not allowed.